Former AG Holder Says Edward Snowden's Leak Was A 'Public Service' : The Two-Way Eric Holder, who was attorney general when the former NSA contractor leaked highly sensitive documents, said what Snowden did was illegal but that his leak brought up important conversations. 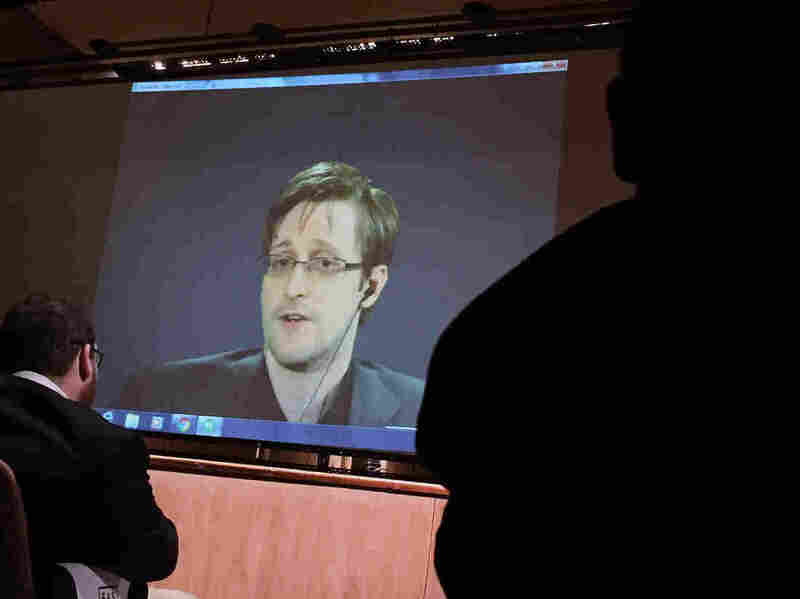 Former National Security Agency contractor Edward Snowden speaks via video conference at Johns Hopkins University in February. Former Attorney General Eric Holder says Edward Snowden's leak was "inappropriate and illegal" but "I think that he actually performed a public service by raising the debate that we engaged in and by the changes that we made." Holder went on to say: "He harmed American interests. I know there are ways in which certain of our agents were put at risk, relationships with other countries were harmed, our ability to keep the American people safe was compromised. There were all kinds of re-dos that had to be put in place as a result of what he did, and while those things were being done we were blind in certain really critical areas. So what he did was not without consequence." After leaking the documents to The Guardian and other publications, the former NSA contractor fled, ending up in Russia where he remains exiled. In his interview, Holder also said that it's time for Snowden to make a decision. "I think that he's got to make a decision," Holder said. "He's broken the law in my view. He needs to get lawyers, come on back, and decide, see what he wants to do: Go to trial, try to cut a deal. I think there has to be a consequence for what he has done." Holder continued: "But I think in deciding what an appropriate sentence should be, I think a judge could take into account the usefulness of having had that national debate."